September is the month that sees National Fitness Day occur. It is a day in the UK that lends itself to all things active and was established as a way to highlight the importance of having an active lifestyle both to help improve your physical health as well as your emotional and mental wellbeing. On the day numerous activities take place across the country with the aim to give people a quick taster of the types of activities that they could participate in regularly in a bid to show people that being active can be fun and doesn’t all have to be about watching calories and reaching your step quota each day. The launch event takes place in Guildhall in London and this year will see Darcey Bussell kicking off the day with a dance inspired workout session that members of the public can book on for free which will then be followed by yoga and body combat sessions. Throughout the country other events will be taking place and teachers, instructors and sports clubs and gyms be offering sessions and open days in a bid to show people the variety of activities that they have to offer. For those people that are already active and that may play a sport regular such as hockey it is a time for them to set a fitness goal to perhaps improve their technique by watching Hockey Training videos like those available from https://www.sportplan.net/drills/Hockey/Eliminating-a-Player/Elimination-Skills-Semi-Opposed-V-drag-Right-to-Left-HTH0037.jsp or perhaps look at ways to improve their strength and stamina for their chosen sport by taking up some flexibility training like yoga or endurance training like swimming and cycling. 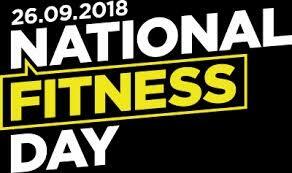 Some people use National Fitness Day as a way to raise money for their chosen charity by perhaps cycling on a static bike in the office for a specific distance or for a set period of time, this may be a team effort or an individual one if you are looking to challenge yourself. If you are a seasoned sports person or athlete, you may look to trying to break a world record or perhaps offer a free training session on the day for new prospective customers or if you wish you can create a closed event just for people who already attend one of your sessions on that day. Schools get involved with the event by offering 10 minutes of activity for all their pupils at 10am on the morning of 26th September. If you have missed participating this year don’t worry this event is held annually and will be back again in September 2019.